Paper bank notes were collected in and around The George Washington University Hospital. The notes were washed in detergent to remove bacteria, which were then grown on mannitol salts agar with or without antibiotic supplementation. Yellow colonies were observed, which was indicative of Staphylococcus Aureus strains. Various strains were treated to purify plasmid DNA. The strains were also cured with Acridine Orange to remove plasmid DNA, and the strains with and without Acridine Orange were grown on vancomycin-supplemented media to test if the plasmid DNA in the strain was related with conferring vancomycin resistance. Strain NB122 seemed to have a resistance plasmid for vancomycin as the strain was not able to appreciably grow in vancomycin-supplemented media after plasmid DNA was removed. While vancomycin-resistant bacteria are not so widespread yet, increasing resistance could cause major problems for public health, as vancomycin is often regarded as the last line of defense against nosocomial- and community-based S. aureus infection. Staphylococcus Aureus is a Gram positive, coccus eubacterium that is found on the surface of the human skin and mucous membranes. It is also found in other areas of human contact, including air, soil, dust, water, and food products. S. aureus is an opportunistic pathogen in humans and animals, and is one of the most frequent sources of hospital- and community-acquired infections. The species is present as a short-lived contaminant, short-term resident, or long-term colony-forming organism. Most strains become infectious usually when the skin or mucous membranes are punctured by a variety of objects, such as needles and surgical devices. Generally, S. aureus produces three broad disease types: a variety of superficial infections such as pimples, boils, and toxic epidermal necrolysis (characterized by outer layer of skin separating from deeper layers); systemic infections such as endocarditis (inflammation of heart valves), osteomyelitis (inflammation of bone or bone marrow), and pneumonia; and toxinoses such as food poisoning or toxic shock syndrome (Iandolo 2000). The basis for pathogenicity depends upon a number of virulence factors: a variety of surface proteins on the bacterial cell membrane allow for the attachment and colonization of the bacteria within the cellular and extracellular material of the host; cellular proteins, proteases, and toxins that inhibit phagocytosis and interfere with the ability of the host to actively hinder infection by a specific immune response; and, hemolysins and other enzymes that aid bacterial populations in the invasion of host tissues (Archer and Crossley 1997). Furthermore, the accumulation of resistance factors has rendered the bacteria immune to a variety of commonly used antibiotics, thus increasing the ability of the bacteria to survive in hostile environments. Before the advent of antibiotics, S. aureus-associated bacteremia was linked to an 82% mortality rate, mostly among young adults (Cui and Hiramatsu 2003). With the introduction of penicillin (in 1941), virtually all known strains of the bacteria were susceptible to the new antibiotic. However, within three years, S. aureus developed a resistance mechanism to penicillin via enzymatic degradation of the invading antibiotic by beta-lactamase (Neu 1992). Subsequently, in the 1950s, during an influenza outbreak, many people died due to nosocomial infections caused by antibiotic resistant strains of S. aureus. A new wave of effective antibiotics was developed, which included beta-lactamase stable penicillins (such as methicillin), the cephalosporins, and vancomycin. In the 1960s and 70s, however, the global emergence and increase of methicillin-resistant S. aureus (MRSA) caused a shortage of effective beta-lactam antibiotics to MRSA based infections (Cui and Hiramatsu 2003). Resistance to methicillin, and a variety of other antibiotics with mechanisms of action similar to the beta-lactam antibiotics, was primarily the result of the acquisition of the mecA gene (Neu 1992). How this resistance developed is still debated as MRSA strains were reported in some countries even before the introduction of methicillin itself. Currently, it is thought that resistance may have arose either due to a different form of resistance to naturally occurring penicillins or methicillin-like antimicrobial agents in the environment; or it may be due to acquisition of the gene by horizontal transmission of genetic elements from Staphylococcus sciuri (Cookson, Fluit and Schmitz 2003). Due to the global emergence of S. aureus with the capability of resisting a variety of antibiotics, vancomycin became the only remaining antibiotic for treating serious S. aureus infections (Cui and Hiramatsu 2003). Recently, however, due to the use of vancomycin for treatment of hospital-based infections, there has been growing resistance to vancomycin by species such as Enterococcus (Neu 1992). The emergence of vancomycin resistance in Enterococcus gave rise to the possibility of horizontal transmission of resistance elements to S. aureus. In the laboratory, vancomycin resistance has been transferred from Enterococcus faecalis to S. aureus, which stably expresses the phenotype (Cookson, Fluit and Schmitz 2003). Moreover, there have been various clinical isolations of S. aureus with diminished susceptibility or resistance to vancomycin, the first in Japan in 1996 (Cui and Hiramatsu 2003). The recently discovered possibility of S. aureus acquiring vancomycin resistance has stemmed the research to attempt to observe the occurrences of these bacteria, especially in and around hospital environments. Because vancomycin is often considered to be the last available treatment for MRSA strains, VRSA is a threat to public health. Widespread occurrences of these strains could lead to outbreaks of staphylococcal diseases in both the hospital and community. This current project looks for S. aureus with diminished susceptibility to vancomycin on paper bank notes. Because bank notes are easily transferred from person to person, they could potentially harbor a variety of bacterial species that may or may not be part of the normal microbial flora of humans. In this study, we found 50-200 colonies per culture of S. aureus extracted from paper bank notes that were able to grow at high concentrations of vancomycin. Materials  Growth media and antibiotic resistance test kits were obtained from Fisher Scientific; antibiotics used were obtained from Sigma in St. Louis, MO; all other materials were supplied by the Department of Biological Sciences of the George Washington University: mannitol salts agar and LB broth/agar plates; detergent and equipment for bank note filtration; reagents and equipment for Gram stains, plasmid purification, plasmid curing, and gel electrophoresis; and BD BBL Dry Slide Nitrocefin for beta-lactamase test. Sample collection  Bank notes of $1 and $5 denominations were obtained from The George Washington University Hospital's gift shop, a snack cart outside the hospital's doors, and a convenience store near the hospital. The notes were placed in sterile bags until use. Isolation and Quantification of S. aureus Bacteria were removed from the banknotes by washing with a detergent composed of 1 ml of 10% Triton X-100/500 hundred ml of distilled water. An aliquot of the detergent was placed inside the bags containing one bank note, and bags were shaken for 15 minutes. The bacteria were collected by filtration under aseptic conditions through 0.45 micron nitrocellulose filters (Millipore). After filtration, the filters were washed and placed onto mannitol salts agar plates (to select for the growth of osmotolerant Staphylococcus), after which the plates were incubated at 37oC for 24 to 48 hours. Antibiotic resistance was assessed by replica-plating the colonies onto mannitol salts agar plates supplemented with the following antibiotics: 0.5% vancomycin, 0.5% erythromycin, 0.5% tetracycline, and 10-6 % chloramphenicol. Figure 1. Filter plates on mannitol salts agar yielded growth of small, yellow colonies of Gram-positive, cocci bacteria. (Top: Filter plate on bank note D67708529A, collected from snack cart outside hospital; Bottom: Filter plate on bank note C19248359F, collected from hospital gift shop). Pictures taken with 4.0 megapixel digital camera. Plasmid DNA isolation  Selected antibiotic resistant strains were examined for plasmid DNA. Cells were grown in LB broth overnight and 3 ml of cells harvested for plasmid purification. The broth from each inoculation was centrifuged for 10 seconds, after which the supernatant was discarded. Two hundred microliters of a suspension buffer were added and the cells were re-suspended. Ten microliters of an alkaline protease solution was added to the tubes containing the broth, which were then placed in a 37oC water bath for 10 minutes. Two hundred microliters of a sodium hydroxide and SDS detergent solution were added. The tubes were shaken for 2 minutes and then allowed to stand at room temperature for 5 minutes. Two hundred microliters of 3 M sodium acetate was added. The tubes were again shaken for 2 minutes and then placed in ice for 5 minutes. The tubes were spun in the microfuge for 5 minutes and the resulting supernatant was transferred to a fresh microfuge tube. One ml of ice-cold 100% ethanol was added and the contents were mixed before being placed at -70oC for 5 minutes. The tubes were then centrifuged for 2 minutes and the resulting supernatant was discarded. After the pellet was allowed to dry, it was dissolved in 20 microliters of TE buffer and placed at 4oC for 24 hours. Gel for the separation of plasmid was run at twenty volts overnight, then stained with ethidium bromide. Plasmid curing  Plasmid curing was carried out using the method of (Silhavy, Berman and Enquist 1984). Selected isolates were grown in LB broth supplemented with 0.100 mg/ml acridine orange (AO) at 37oC for 24 hours. The cells were then tested for antibiotic resistance: after transferring a small sample to LB broth supplemented with antibiotic, the plasmid content was determined by carrying out the isolation procedure described above. Table 1. Growth of NB107 and NB122 in different concentrations of vancomycin. Eight banknotes were used in this study. All notes showed substantial numbers of S. aureus colonies (number of colonies ranged from 50-200), indicated by the yellow halo produced around the colonies. This is caused by the ability of S. aureus (and not S. epidermidis or most other osmotolerant bacteria) to ferment mannitol to acids: acid production is detected by a change in the pH indicator from red to yellow. The observed colonies were circular and pale to dark yellow in color (see Figure 1). The diameter of the colonies was about 1 to 1.5 millimeters. Gram stains done on various colonies of different plates showed that the bacteria were Gram positive, cocci, and arranged in irregular, grapelike clusters. The test for presence of beta-lactamase in the bacterial population was positive, as color change to pink occurred on the BD BBL Dry Slide Nitrocefin. Plates with a substantial number of colonies were replica-plated onto mannitol salts agar plates containing vancomycin, erythromycin, tetracycline, and chloramphenicol. A significant number of colonies on original filter were resistant to all of these antibiotics. Figure 2. Growth of strains NB107 and NB122 on mannitol salts supplemented with 0.0025 mg vancomycin per ml of mannitol salts solution. Pictures taken with 4.0 mega pixel digital camera. Two isolates, designated NB107 and NB122, were found to be resistant to high concentrations of vancomycin (see Table 1) and were selected for further study (see Figure 2). Antibiotic resistance, including vancomycin resistance, has been shown to be due to the presence of R plasmids (Neu 1992). Investigation of the plasmid content of both isolates showed the presence of one band on gel electrophoresis (see Figure 3). The presence of plasmid DNA cannot be correlated with vancomycin resistance, so a plasmid curing procedure to eliminate the plasmid from the cells was carried out, after which resistance to vancomycin was retested. If the loss of plasmid DNA was coincidental with the loss of resistance, then this evidence implicates the plasmid in vancomycin resistance. We found that NB122 lost ability to resist vancomycin once plasmid DNA was eliminated by the curing process (see Table 1). The bacterial growth observed on the mannitol salts agar was presumed to be mostly S. aureus. Gram-staining of colonial isolates showed that the bacteria were Gram positive, coccus, and arranged in irregular, grapelike clusters, which is characteristic of Staphylococcal species (Holt, et al. 1994). 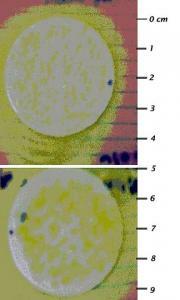 Furthermore, growth of yellow colonies on mannitol salts agar also indicated S. aureus growth. Mannitol salts agar is often a selective medium for Staphylococcus due to the high concentration of sodium chloride that the agar contains. Usually, because of its ability to ferment mannitol into acid, S. aureus grows as yellow colonies on mannitol salts (Leboffe and Pierce 2002). The strains NB107 and NB122 were seen to grow to some extent in various concentrations of vancomycin. While growth of the strains in solution with 0.025 mg vancomycin per ml was limited, the growth was much more profound at a slightly lower concentration of vancomycin (0.018 mg/ml). Thus, these strains could be classified as VRSA or VISA under guidelines set by The National Committee for Clinical Laboratory Standards (Cui and Hiramatsu 2003). The guidelines proposed by Cui and Hiramatsu (2003) could identify these strains as VRSA as they were able to grow in a concentration of vancomycin greater than 0.008 mg/ml. These strains could also be identified as hetero-VRSA, as they were first unable to appreciably grow at a higher concentration of vancomycin, but did grow once the vancomycin was diluted (Cui and Hiramatsu 2003). Thus, it is possible that the colonies of the strains used had small subpopulations of VRSA which contributed to the growth of the strains after initial treatment with vancomycin. Treatment of the strains with AO and observations made on the differences between the AO-treated and AO-untreated samples was done in an attempt to identify if the vancomycin-resistance conferred on the strains was a result of plasmid DNA. Curing agents, such as AO, if administered to bacterial populations in sub-lethal doses, can lead to the elimination of plasmid DNA without harming the bacterial chromosome and thus maintaining the ability to reproduce and generate offspring (Singleton and Sainsbury 2001). Populations of bacteria containing plasmids that are subject to agents such as AO will become more and more dominated by plasmid-free cells with time (Singleton and Sainsbury 2001). With gel electrophoresis analysis of the strains, it was found that only strain NB122 without AO contained plasmid DNA (see Figure 3). This was then postulated to be plasmid DNA conferring vancomycin resistance (though never confirmed) since the population that contained the plasmid (not treated with AO) grew appreciably in vancomycin-supplemented media, while the population cultured with AO to eliminate plasmid DNA did not grow appreciably in vancomycin-supplemented media. This indicates that this latter population resembled VSSA upon elimination of plasmid DNA. It is possible that this plasmid DNA represents the transposon-associated vanA gene cluster found in vancomycin-resistant enterococci, which could be horizontally transferred to other species, consequently conferring resistance to the antibiotic in that species (Archer and Crossley 1997). However, positive identification of the plasmid and its genetic contents was beyond the scope of this project. Determination of the isolated plasmid's role in vancomycin resistance may also be accomplished by using transformation, in which a non-vancomycin resistant strain uptakes purified plasmid. This strain, now with the plasmid, can be grown on vancomycin-supplemented media to see whether it expresses the vancomycin resistance phenotype. Strain NB107 was shown not to contain plasmid DNA upon gel electrophoresis analysis. Furthermore, the growth of the strain in vancomycin-supplemented media was similar for AO-treated and AO-untreated populations. This indicates that the strain's ability to resist vancomycin was likely not due to the presence of any specific plasmid DNA. However, like NB122, NB107 was able to grow in vancomycin-supplemented media. Thus, it is likely that this strain's resistance to vancomycin was a result of a thickened cell wall, which allows the bacteria to inhibit vancomycin molecules from reaching its major target on the cytoplasmic membrane of the cell (Cui and Hiramatsu 2003). Limitations of this project came in the form of a very small sample size, as only a few paper bank notes from a limited number of locations were used to isolate S. aureus strains. To really obtain a notion of the actual prevalence of nosocomial or community VRSA, a much wider array of samples and locations need to be tested. Furthermore, only two of the strains isolated were tested for their ability to resist vancomycin, and the specific nature of the mechanism of resistance the strains display was beyond the scope of this project. However, this type of project is a starting point for determining the prevalence of VRSA, a topic important to public health, as vancomycin is often considered to be the last defense against outbreaks of multi-drug resistant S. aureus infection. The emergence of S. aureus strains that are resistant to numerous antibiotics including vancomycin brings the possibility of returning to an era similar to that before the advent of antibiotics, when S. aureus was a major cause of nosocomial death (Smith, et al. 1999). The major prevention for further VRSA emergence involves more cautious use of vancomycin to prevent its misuse and consequent selection pressure that leads to growth and spread of antibiotic resistant strains. Furthermore, laboratory methods for the recognition of antibiotic resistant strains of bacteria must be improved. Also, infection-control protocols must be followed in treating those infected with antibiotic resistant pathogens (Smith, et al. 1999). Recommendations given by the Centers for Disease Control for reducing the development and transmission of S. aureus include development of a quantitative method to detect strains that are less susceptible to vancomycin, education for health care workers about infection-control measures, and implementation of active surveillance for resistant strains in laboratory and health-care environments (Smith, et al. 1999). Because S. aureus resistance to vancomycin is growing, measures such as these, as well as looking for new antibiotic options, are needed to minimize infections by the resistant strains as much as possible. I thank David Morris of The George Washington University Department of Biological Sciences for advice during all stages of the project and for critically reviewing the manuscript. Archer, G.L. and K.B. Crossley (Eds.). (1997). The Staphylococci in Human Disease. New York: Churchill Livingstone Inc.
Cookson, B., A.C. Fluit and F.J. Schmitz. (2003). Introduction. In A.C. Fluit & F.J. Schmitz (Eds. ), MRSA Current Perspectives (pp. 1-9). Norfolk, England: Caister Academic Press. Cui, L. and K. Hiramatsu. (2003). Vancomycin-Resistant Staphylococcus Aureus. In A.C. Fluit & F.J. Schmitz (Eds. ), MRSA Current Perspectives (pp. 187-212). Norfolk, England: Caister Academic Press. Holt, J. G., et al. (1994). Bergey's Manual of Determinative Bacteriology (9th ed.). Baltimore: Williams & Wilkins. Iandolo, J. J. (2000). Staphylococcus. In Encyclopedia of Microbiology (Vol. 4 pp. 387-393). San Diego: Academic Press. Leboffe, M.J. and B.E. Pierce. (2002). Microbiology: Laboratory Theory and Application. Englewood, CO: Morton Publishing Company. Neu, H.C. (1992). The Crisis in Antibiotic Resistance. Science, 257:1064-1072. Silhavy, T.J., M.L. Berman and L.W. Enquist. (1984). Experiments with Gene Fusions. Cold Spring Harbor, NY: Cold Spring Harbor Laboratory Press. Singleton, P. and D. Sainsbury. (2001). Dictionary of Microbiology and Molecular Biology (3rd ed.). Chichester, UK: John Wiley & Sons, LTD.
Smith, T.L., et al. (1999). Emergence of Vancomycin Resistance in Staphylococcus Aureus. New England Journal of Medicine, 340:493-501.